Anthony Joshua made it three boxing golds for Britain at London 2012 with a dramatic win over Roberto Cammarelle in Sunday's super-heavyweight final. This is Great Britain's 29th gold medal and Royal Mail's 29th gold medal stamp. 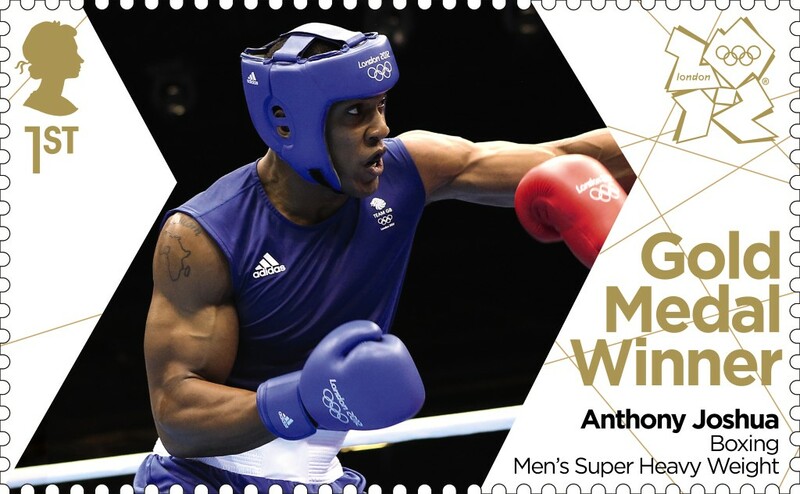 29 Gold Medal Winners, 29 Gold Medal Winner's Stamps! Congratulations to Royal Mail for their superb achievement of producing the mini sheets and the successful distribution to all 500 post offices. Royal Mail should now be awarded their own 'Gold Medal'. I went to my local post office today (Manchester Spring Gardens) and was told that they were not selling the stamps singly - although some post offices were. When asked which ones were selling them singly I was told that she was not allowed to disclose "commercial information". Can this be right - that some post offices will sell single stamps whereas others won't? Surely there is a ruling from Post Office HQ as to whether single stamp sales are allowed, or are not allowed .... surely it shouldn't be something for each individual post office to decide! I cannot afford the £90+ tarrif for a full set in miniature sheets, so where do I go to get the single stamps??? It appears that POs which have a demand for whole mini-sheets are allowed to sell them, and have discretion to split into singles. PO Ltd & RM Ltd only said that post offices were permitted - on this occasion unlike any other - to sell singles from the MS. I have already written that we have single stamps available for collectors, and you don't even have to buy the whole set if, for example, you only collect stamps about cycling. so Ian - how can I get a full set - of single stamps?? Other items from the shop can be added for only one postage charge. If you want anything additional that is not shown, or any 'sport-specific' medal sets, please use either the comment box on an order, or the 'Contact Us' form. Payment details will be sent when the stamps are available, there is no facility to pay on ordering. Currently we are still waiting for GMW 23-29 to be delivered.